The multi channel organ bath system is the hallmark of the drive for productivity and result in academic and in industry research labs. The DMT version expand on the classic design with extensive automation of fluid control, programmable washing routines, integrated data acquisition and being GLP capable. All these features increase research throughout, reproducibility in a more hands off approach so laboratory personnel can focus on data analysis rather than washing glassware. Add on options include stimulation electrodes, custom shaped stimulation electrodes and stimulators to match your tissue. 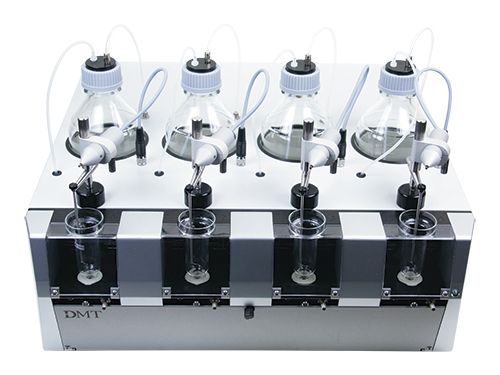 The addictive workhorse for your routine high-throughput pharmacological studies on nearly all type of muscle. An isolated organ bath assay is the classical pharmacological screening tool to assess concentration-response relationships in contractile tissue. Although a variety of molecular tools have become available in recent decades to assess cellular responses in high-throughput quantities, the organ bath assay is still considered a valuable tool for lead optimization and for the elucidation of the mechanism of action. In addition, organ bath assays are widely used in preclinical safety studies.​ Find here all the different types of Tissue Organ Bath Systems. The most common application of the organ bath assay is in cardiovascular research, using isolated aortic rings, heart tissue (papillary muscle, left ventricles) or arteries. For studying gastro-intestinal effects, preparations of ileum and colon are often used, but also gastric antral muscle and sphincter may be studied. Respiratory effects can be studied in isolated tracheal rings, phrenic diaphragm preparations, pulmonary arterial smooth muscle and even lung parenchyma. Other smooth muscle preparations that are used in organ bath research are urinary bladder, penile muscle strips and prostate. State-of-the-art research instrument for the in vitro study of larger blood vessels (>500 μm) and other tubular tissues mounted as ring preparations of up to 10 mm in diameter, such as trachea or gut. This Tissue Organ Bath System is an improved version of the 700MO system with a re-designed Myograph-Interface. The myograph system is ideal for work requiring a higher throughput, such as drug screening, running concentration response curves or in experiments where separation of vessels in separate baths is necessary. • The heating has been made more accurate down to the individual bath level. • The operation of the interface has been made even more intuitive and easy to handle. The front switches have been replaced by a graphical color touch-display. The 750TOBS has been used extensively to investigate the physiology and pharmacology of smooth muscle and other muscular tissue preparations. An ideal student Tissue Organ Bath System, recommended for a large variety of studies, predominantly in the teaching environment.